As a graphic designer, I sometimes think I understand architecture better than the average person, but after speaking to an architect, I realize how little I actually know. 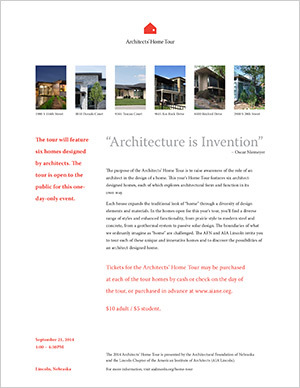 I guess that’s part of the reason some of my favorite projects I have had the opportunity to work on are for architects, and the 2014 Architects’ Home Tour promotional materials are no exception. The learning process is eye-opening, and the ability to see first-hand what an architect can envision a livable space to be like, is inspiring. This is actually the 5th home tour I have had the opportunity to do design for, and I think this one is extra special – or maybe that’s just because it’s landing on my fortieth birthday. This years’ tour website. 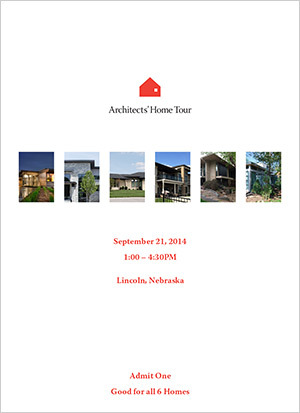 The Lincoln home tour is held every other year, and is co-sponsored by AIA Lincoln and the Architectural Foundation of Nebraska. There are six homes on the tour, and as usual, it looks like there is a wide variety of styles to view. The program booklet cover, which also serves as the ticket into the homes. These can be purchased at any of the homes the day of the tour. Download the tour poster. And I look forward to seeing you on September 21st. The tour runs from 1:00 – 4:30PM. 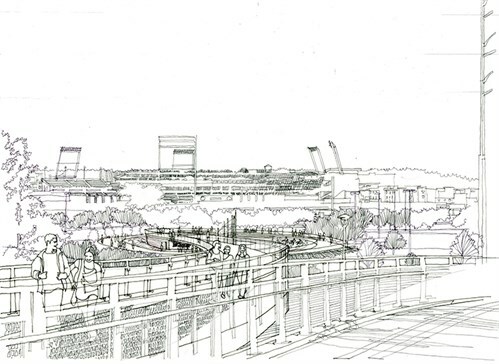 This entry was posted in Ask the Architects on September 4, 2014 by Donovan Beery. Architects are well aware that designs have a significant impact on the environment. Understanding that impact with analytical data has been a challenge. Building performance is complex and the tools and information required to make informed, timely decisions has typically not been readily available. Architects have relied on rules of thumb, industry standards, rudimentary analysis and calculations, and prescriptive requirements to attempt to achieve “green design.” Although well intentioned, these methods often fall well short of significantly improving building performance. Residential and commercial buildings account for over 30% of the total energy and 70% of all electricity consumed in the United States. The requirements for improving on building performance and efficiency are becoming stricter and will require a shift in the paradigm for how projects are delivered in the future. The rules of thumb and prescriptive methods of green design will simply not be adequate to achieve these greater performance standards. Typically building performance is analyzed by the engineers in a process somewhat isolated from the architects and occurring after the design is essentially complete. Feedback to the architect is limited and provided too late in the process to have meaningful effect on the design. Earlier analytics in the design process is becoming necessary to achieve the higher performance standards required. The advent of Building Information Modeling (BIM) in the design industry approximately a decade ago has continued to transform the entire design process. What started as a platform to allow for greater coordination, consistency, and visualization has evolved into a platform that provides levels of information far beyond what was previously available. This evolution now includes building performance analysis tools for the architect. Models and design concepts generated very early in the process can be analyzed for their performance and efficiency. Feedback is immediate and the data can be used as a basis for decision making. Virtually all aspects of the building envelope can be evaluated and optimized for maximum efficiency, including: building orientation; thermal values of walls, roofs, and openings; glazing types and amounts; shading devices; day lighting effectiveness, etc. The goal is to maximize the efficiency of the building envelope and minimize the energy load on the building. The following outlines some of the design data that can be generated from performance modeling. 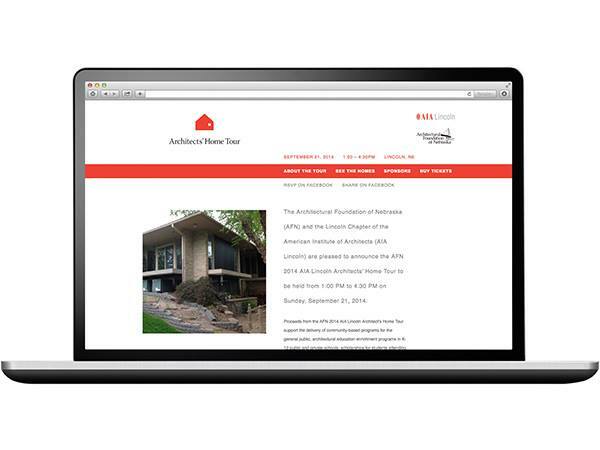 This entry was posted in Ask the Architects on May 29, 2014 by Todd Hesson.